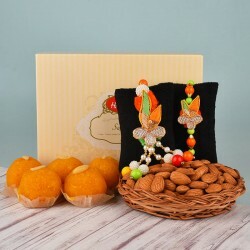 Raksha Bandhan is a very colourful festival and a favourite among the kids. The little Brothers love it when their Sisters tie them those special Rakhis with their favourite cartoon characters on them. 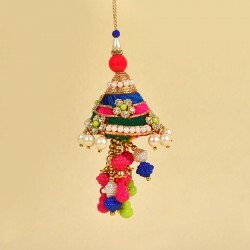 To make this festival fun for the Kids, order Rakhis from MyFlowerTree that have been curated just for them. It is one of the best feelings in the world when you get to tie a Rakhi on the wrists of your Brother and a Lumba on the hands of your Bhabhi. The fun of Rakhi doubles up when you have more than one brother to celebrate it with. It is a dream of every Sister to tie a Lumba to her Bhabhi. If you are the fortunate one, make this Raksha Bandhan special for your favourite couple by ordering a beautiful Rakhi and Lumba for them. You have been celebrating your bond with your Brother on every Raksha Bandhan but this year; strengthen your bond with your Bhabhi. If you are on the lookout for a beautiful Lumba, you have come to the right place. 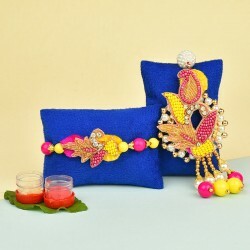 With beautiful Peacock and Flowers Lumbas, we are ready to make this Raksha Bandhan special for you and your Bhabhi. These Lumbas are available in endless colours like yellow, red, orange, purple, pink, blue, green, and many more. Some of the Lumbas are made with exquisite embroidery as well. Your Bhabhi is sure to adore them for a very long Time. 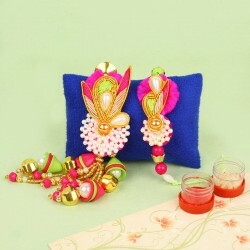 Pick an adorable lumba rakhi and steal her heart with something exemplary. Not just a single Rakhi or a single Lumba but you can order a complete set too. 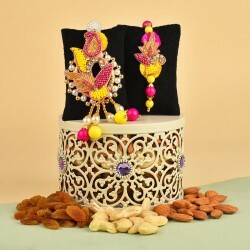 Buy matching Rakhi and Lumba set for your Bhaiya and Bhabhi and wish the blessed couple on this special occasion. Together they are going to shower you with lots of love and care and maybe some gifts too! 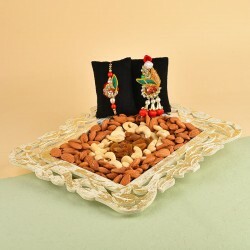 So go ahead and place your orders for a perfect Rakhi and Lumba set for your Bhaiya and Bhabhi this Raksha Bandhan. Check out our exciting gifting options for the adorable couple that your bhaiya bhabhi are. 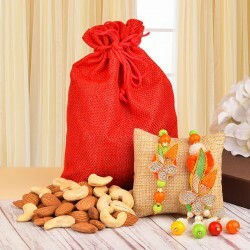 More than just simple Rakhi Threads! At MyFlowerTree, we always try our best to give you the best. The Rakhis that we have are anything but ordinary. 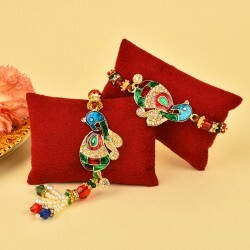 These have auspicious designs of Lord Ganesha, Peacocks, Elephants, Flowers and more. And this is not all. 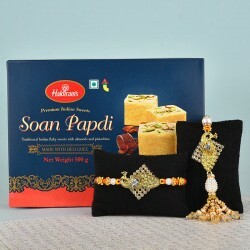 We have special Silver Rakhi, Kundan Rakhi and Rakhi Bracelets too for your lovely brother. 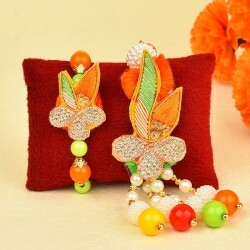 Make this Raksha Bandhan the best ever with special Rakhis from our Raksha Bandhan collection. 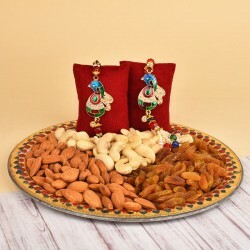 Along with Rakhis and Lumbas, order a special Raksha Bandhan Gift Hamper for your Bhaiya and Bhabhi. 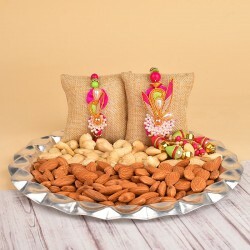 At MyFlowerTree you will find everything like Our Bhaiya Bhabhi Raksha Bandhan Gift Hamper includes couple gifts, Dry Fruits, Sweets, Cakes, perfumes, Jewellery, Soft Toys and more. 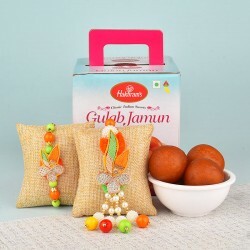 These Gifts Hampers are enough to let them know how much you adore the couple and love them. 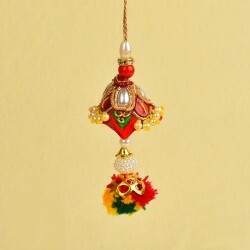 Rakhi Delivery in India is possible with just one click with MyFlowerTree. Now you can send a Raksha Bandhan surprise to your Brother at the comfort of your home. 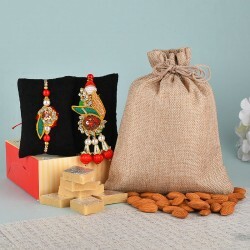 All you need to do is to make a few clicks on your computer system and tell us when and where you would like to send your chosen Raksha Bandhan Gifts through our online portal and we will do it for you! We never compromise on quality, ever! So you need not worry about the delivery. It will always be on time and without any hassles. We cover the largest area in India as far as delivery is concerned with many remote city areas as well. Not just this but we deliver internationally as well!